This is a curious case of a piece of mass produced media becoming remarkably popular for not only its original form but for all its other manifestations, despite the fact the original purpose of the poster failed to materialise. Having spent seventy years in total obscurity, a poster, dating to the early days of the Second World War, was rediscovered by Stuart and Mary Manley of Barter Books. Upon this discovery, this little poster soon became a hit with costumers with its place now adorning a wall of the bookstore, and orders for reproductions were arriving in an intriguingly rapid fashion. Once enquiries on the poster’s rights were cleared, it went on sale, and now over a decade later this is arguably one of the most recognisable and financially successful posters to have ever been produced. Its popularity has become global, and as Lewis suggests, the poster seems to evoke ‘nostalgia for a certain British character.’ As Britain entered the war, posters such as this were considered a vital source of propaganda, which aimed to rally the country and repel the objectives of the enemy. The poster successfully portrays the simple five-worded message. The lack of images draws the reader to the words and having the addition of the crown above suggests the tone of authority, poise and fortitude. It is clear this is a message from the state, indicated by the use of the Crown illustration, but what was the poster aiming to achieve? In a modern setting the message conjures a playful resolution similar to the simple two-word message depicted on the cover of The Hitchhiker’s Guide to the Galaxy (Douglas Adams 1978), where ‘Don’t Panic’ is inscribed in ‘large, friendly letters’. However, the undertones of the poster’s design were much more sinister. In 1939, as Britain stood on the brink of another great war, the Ministry of Information (MOI) were handed the task to create a set of posters displaying a specific set of messages. Those messages reflected instructions of how the public should behave in the event of national threats, such as an enemy invasion. The posters were to be sent to locations across the country where they could be dispatched and placed in public spaces in a matter of hours, in a mammoth operation of distributing propaganda. This was no easy task then. As drafts were drawn and ideas were selected and rejected, much opposition was met with the final chosen few. Such posters as ‘Keep Steady’ were considered uninspiring; ‘Your Courage, Your Cheerfulness, Your Resolution Will Bring Us Victory’ was not particularly catchy; and ‘Freedom is in Peril’ was slightly too abstract. 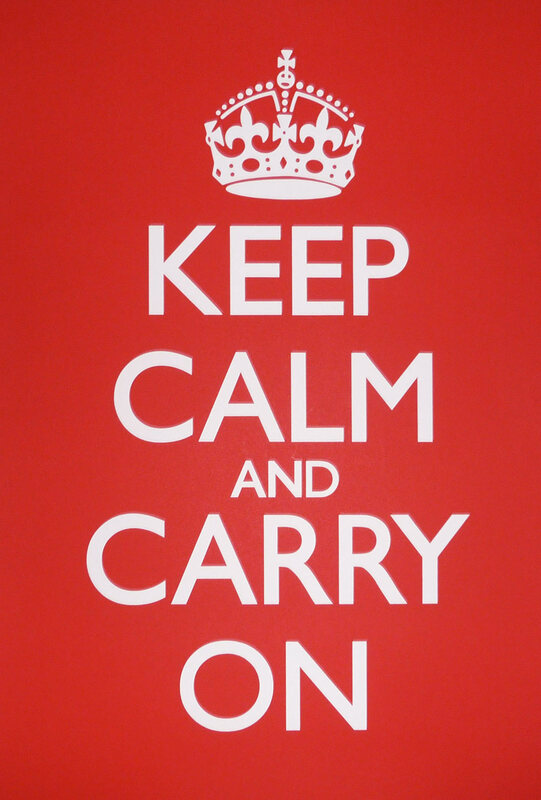 ‘Keep Calm and Carry On’ was another poster in this batch and another that was never to see its place on a billboard. 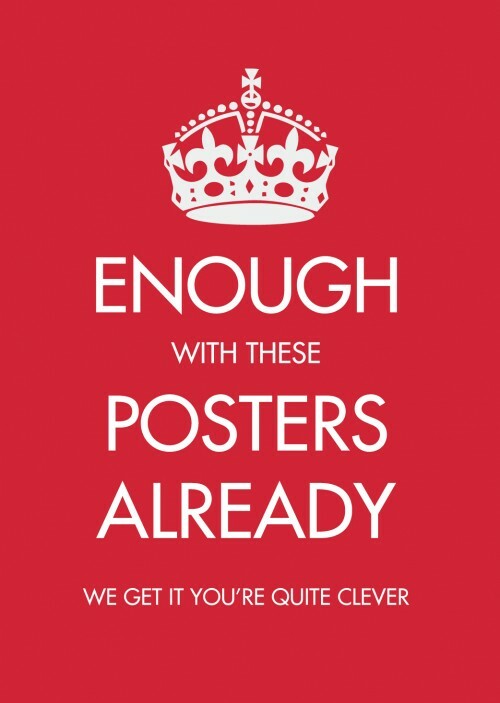 Although the posters were printed in limited quantities all were archived in case the threat to the country became a reality, and once the threat waned they lay almost forgotten, whilst the public remained completely unaware of the preparations the government were taking behind closed doors. Lewis highlights that ‘posters are by their very nature, ephemeral items, intended to be displayed for a set time and for a set purpose, then disposed of’. This poster, along with a select few of other Second World War posters, bucked this trend – trends of which are arguably key principles inherent in this form of communication. Out of all the posters created by the MOI in 1939 it may not be surprising that the ‘Keep Calm’ poster has experienced a resurgence of popularity. The recession of 2008 allowed the poster’s message to be reapplied in a modern context. It’s simplicity and malleability set the opportunity for an almost unlimited number of imitations, each displaying a new message and invoking new emotions. The success of this poster came after seventy years of dormant anonymity; following its initial failure to inspire it’s own production and distribution. Yet the message lives on with renewed pertinence, and it is with relief that we can enjoy this artwork without the menacing threat that went with the initial design. Tags: Don't Panic, graphic design, posters, propoganda. Bookmark the permalink.